Reverse osmosis systems (RO) are filtration units that are primarily used when water is contaminated by water-soluble particles. In many cases, other filtration systems cannot remove these contaminants. Water-soluble particles are particles that bond with the water at an atomic level, like salt in salt water. The filter removes most particles that are larger than water. Buy reverse osmosis water filters from reputable manufacturers like Arrow Industries and General Electric, right here at PlumbersStock. Browse through our products here or check out all our water softener systems. How Does a Reverse Osmosis Filter Work? Reverse osmosis is similar to osmosis in that it uses a membrane. The main difference between reverse osmosis and regular osmosis is that instead of equalizing the solutes in the water through the membrane, reverse osmosis removes the solutes from the water as it passes through the membrane. 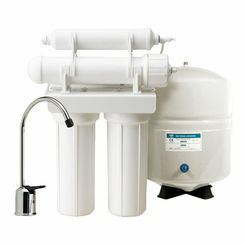 Reverse osmosis filters use pressure to force water through the membrane. In most households, reverse osmosis units use the pressure that is generated in your water line. If your water line has low pressure or you have hard water you might want to look into a unit that has a pressure booster to assist in moving the water through the line at the proper pressure needed to remove all the solutes. What Should I Know about Reverse Osmosis Membranes? Membranes are made with a pressure vessel that allows feed water to be pressed against the membrane. The two most common ways membranes in reverse osmosis water systems are made are the spiral-wound and hollow-fiber with layers around the pressure vessel core. Part of the water passes through the membrane allowing it to filter the water, while the rest of the water is used to remove the concentrated waste. All membranes are specially designed to allow very small particles through. Each manufacturer offers different membranes that have different sized pores. Those membrane pores can vary from 0.1 nanometers to 5,000 nanometers, which is a big difference in what can and cannot pass through the membrane. 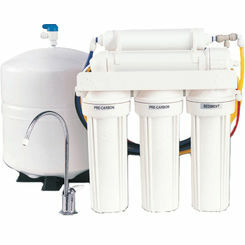 There are also two main membranes to consider when looking to buy a reverse osmosis system. The first is the cellulose triacetate membrane, or the CTA, which can withstand chlorinated water. The other membrane is the thin film composite membrane, or the TFM or TFC, this membrane cannot withstand chlorinated water and must be used with a carbon filter. A sediment filter to trap particles like rust and calcium carbonate, and optionally a second sediment filter with smaller pores. An activated carbon filter used to trap organic chemicals like chlorine. A reverse osmosis filter to capture particles just larger than that of water. An optional secondary carbon filter used to trap missed organic chemicals. An ultraviolet lamp used to sterilize any microbes that are missed in the previous steps. With the best prices on the web, you have come to the right place. If you have any trouble locating the best reverse osmosis system for your home, please contact our customer support team. Thank you for choosing PlumbersStock. We have all kinds of plumbing products, including various types of water softeners, and water softener cartridges.